Are We Ready for Voice Search? The year that voice search finally breaks through? We’re several weeks into 2015 and some New Year’s resolutions have already failed spectacularly, the optimism of just a few weeks ago replaced with the grim reality of getting back to our normal routines. However, despite our collective lack of willpower to see through our promises of self-improvement, there is still plenty of enthusiasm for what the year ahead can bring and what this means for tech predictions. Of all the big trends that are coming to fruition in 2015, the one that excites me most is the growth of voice search. I firmly believe that we are going to see a big change in the way that we search, and that voice is at the heart of that change. We’ve been typing queries into search engines for almost two decades, but when you think about, typing keywords into a box is a pretty unnatural way of discovering information. We’ve only learned to search using keywords because of how search engines were originally designed, but our natural curiosity springs from language. Usually when we want to find information we articulate it as a question. We do this every day, probably without even realising it. I was watching Snow White & the Huntsman over the holidays and I was surprised to see what looked like Nick Frost playing one of the dwarves. My first inclination was to lean over to my wife and ask: “Is that Nick Frost?” and because we couldn’t decide for sure, inevitably we turned to Search to solve the mystery. A quick search on Bing for “nick frost imdb filmography” gave me the answer I was looking for – he was indeed in Snow White & the Huntsman as the dwarf Nion. But look at how my query was shaped by my previous search experience. Instead of asking the question “Was Nick Frost in Snow White and the Huntsman?” I cut out everything extraneous to the essential keywords where I knew I would get the answer I needed. Because I was using a search engine, the query that I typed was nothing like the original question that I formulated when I asked my wife. We think more quickly and naturally in language, and our search engines should be able to adapt to us, not us to them. Wonderfully, now we actually have the technology to ask natural language questions and for the search algorithms to interpret what we mean. 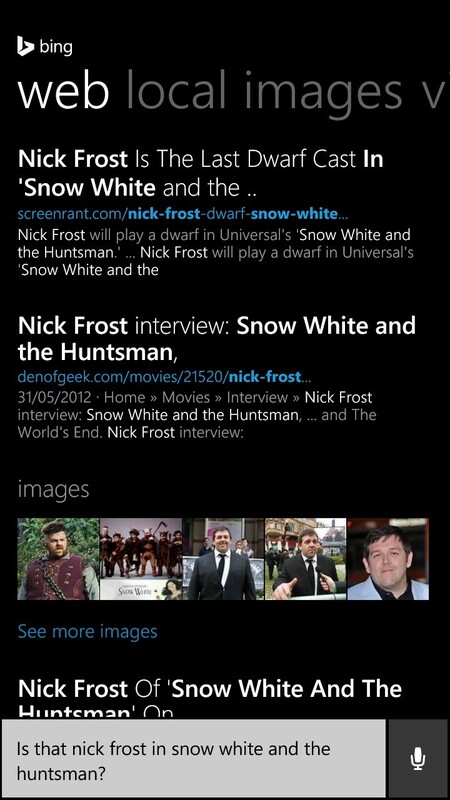 As a test I asked Cortana on my phone: “Is that Nick Frost in Snow White and the Huntsman?” and she provided me with the answer, without me having to click on any result. In this case, not only was it easier to ask the search engine through voice than typing, the response was quicker too, as I didn’t have to click on any results to get the answer I needed. The problem is, we have become conditioned to feed search engines using a typing mechanism, which raises an interesting question – are we ready for voice search? Data from recent studies from Thrive Analytics and Northstar Research certainly seems to suggest that we are ready to embrace voice search, thanks to the rise of digital assistants. Whilst the first iterations of voice-enabled assistants were somewhat limited, we’ve come a long way in five years. The development of technology and improved functionality enabled in Siri, Cortana and Google Now has seen a dramatic increase in people using digital assistants on their smartphones. A June 2014 study by Thrive Analytics found that over half of US adult smartphone users (56%) had used a digital assistant with seven out of ten 18-29 year old smartphone users (71%) making use of Siri, Cortana or Google Now. These interactions are not just one-offs; the research found that usage of digital assistants had doubled between June 2013 and 2014 and that 24% of users were using voice search on a daily basis. What’s interesting is that although 35% of digital assistant users did so primarily in the comfort of their own home, almost a third (31%) talked to their phone on the go, overcoming perhaps the biggest obstacle with voice search which is the embarrassment of talking to your phone in public. A further study conducted by Northstar Research on behalf of Google showed even greater adoption, with 55% of teens between the ages of 13 to 18 using Google voice search more than once per day. The numbers point to an increasing willingness to use voice search. And why not? Voice is very easy to use and more intuitive than keyword search with the added bonus of being hands free which opens up lots of scenarios for searching on the move. So if search is changing and 2015 is the breakthrough year for voice search what does this mean for marketers and how are these changes going to affect search advertising? I think the first thing to make clear is that these are still relatively early days for voice search. Even though usage is growing, it’s not going to overtake typed queries anytime soon. From a paid search perspective, we are not expecting drastic changes in 2015. However, for organic search it is definitely worth thinking about how voice search will impact the type of queries that are being made and therefore what needs to be optimised. One thing is for sure: people speak and type very differently when trying to access information. As we saw before with my Nick Frost example, we have conditioned ourselves to search in certain way which revolves around concise use of keywords. Voice search is much more natural so we could well see the return of long query searches such as “nice reasonably priced Italian restaurants in London” rather than “London Italian restaurants”. Voice also means that semantic search is going to become a lot more powerful. Try typing “I’m hungry” into a search engine right now and the results you will get will be dreadful because they’re driven by keyword rather than semantic search. Voice gives us the opportunity to get to the heart of semantic search and suddenly natural language queries like “I’m hungry” could be best converting query for any restaurant or takeaway service, because the intent behind that search couldn’t be clearer – I need food, show me somewhere to satisfy my hunger. Personal assistants have the greatest potential to leverage the strengths of both voice and semantic search, as they can understand the context of the query and match that with the information they know about the user, such as their likes, location, habits etc. This combination of voice and semantic search is hugely exciting, and ultimately what could drive search to the next level of utility – understanding semantics and context to provide more personalised, relevant results. Are we ready for voice search? You’d better believe it.